Excellent post - well done. A friend of mine David Morton died that night. I will never forget the funeral and the sense of total loss among the community - it still exists today. Hi Debbie - thanks for commenting. RIP your friend David Morton. I was a bit older - by 6 years - and it was a very special night for me as we decided to set a wedding date that night. Now-hubby and me were in the Abbey Mooney for a a drink (soft!) before I went to Mount Carmel for the 11-7 night shift (agency nursing) and he went off home. Sometime during a quiet night shift news began to filter in of a fire in a nightclub on the Northside. I lived in Drumcondra and often cycled out to Raheny to St. Joseph's Hospital and I knew every corner of Dublin by bike from the diversity of agency nursing. I remember cycling home after that night not knowing the full extent of the disaster - no Twitter or FB then, and no mobile phones. I think I had phone contact with Jan at some stage, but that's a bit blurry. What I do recall is the chill cycling down Orwell Road and home through a deserted city at dawn. Horrific days followed as the hospitals filled with injured and I was on night duty in the Mater and Jervis Street a lot. 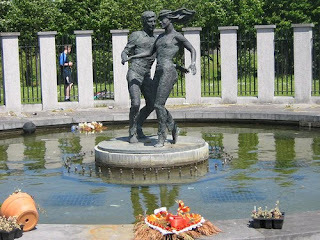 It was desolation like I hadn't seen since the Dublin bombings in 74 when I was a student. I missed those by minutes as I slept in a friend's flat in Dartry that day - on nights and would normally cycle from Drumcondra thru' Parnell St. or North Earl St. Horrific times. We talked about it last night - every year it comes back to haunt us, the Stardust. RIP to all and may their families find justice one day, though I fear they won't - big developers will probably take over the site one day. I want to thank particularly audreyb and mofraz for their comments and their poignant links. Your contribution makes this story real again. Maurice - we probably met - all those years ago!